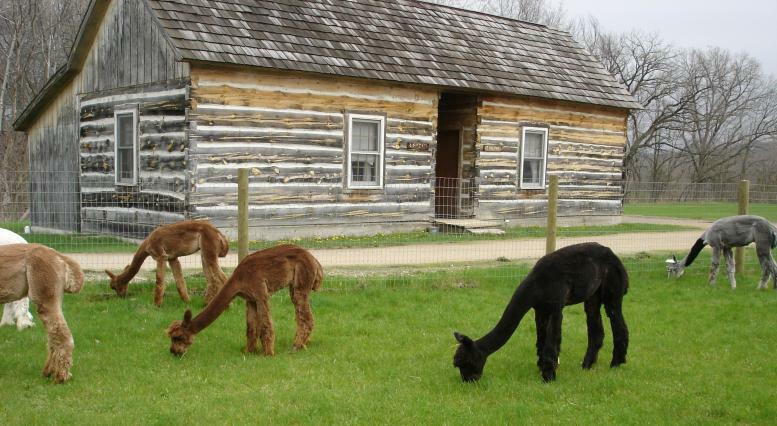 Welcome to the 45 lovely, secluded acres of Galena Log Cabin Getaway and the Adventure Creek Alpaca & Goldendoodle Farm. 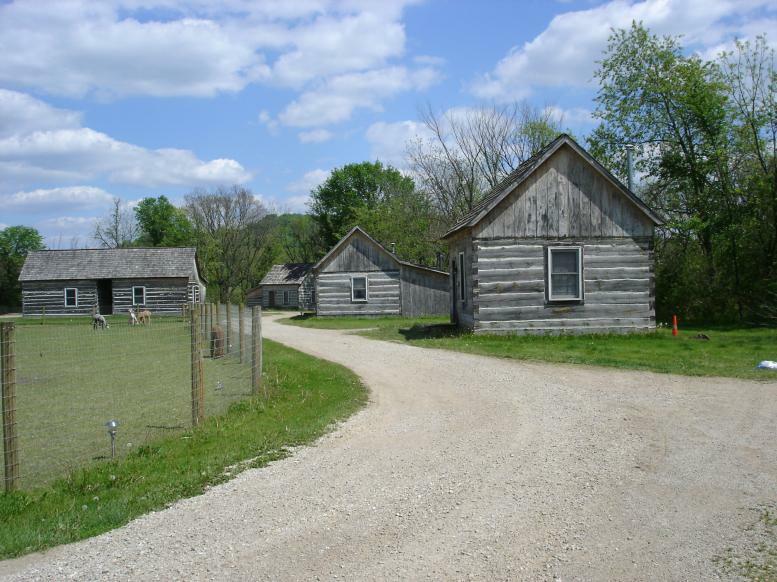 Owned and operated by Ruth and Frank Netzel, we are a working rural farm with 12 log cabins. Just 4 miles (less than 10 mins) south of Galena. We are totally surrounded by 500-ft ridges, which cut us off from the traffic din, diesel smells, train traffic and the bright city lights of Galena. 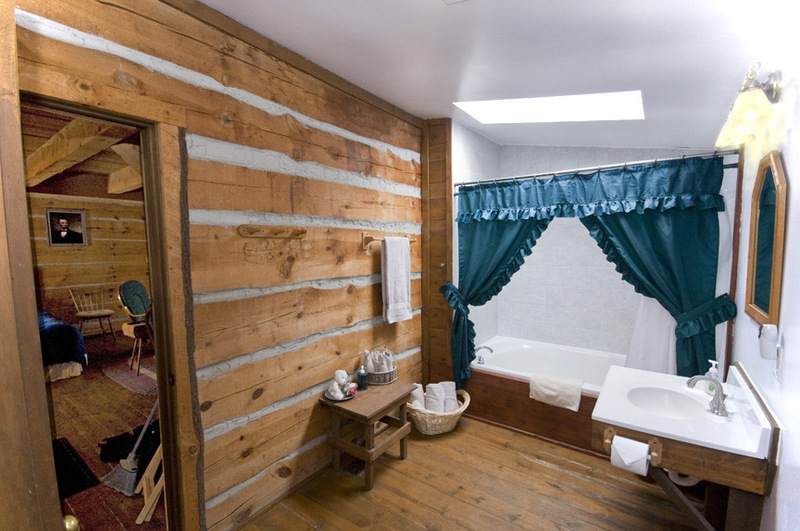 Our historic one-room cabins offer 660+ sq ft of living space with an open loft. Behind a closed door you'll find a modern bath with 6-ft double-whirlpool tub and a 2-by-4 foot skylight. All of our cabins are traditionally constructed with all walls and supports built entirely without nails. We also have four dog-friendly cabins. Dogs only. Sorry, any other animals cannot be accommodated. The Netzels will also show you their prized alpaca farm. Their alpacas are quiet, stately, regal animals that are friendly to people - especially to smaller children. Meet Quincy, a TV star. Take one of our alpacas for a walk. Or come down to the farm just to say hello to the alpacas and goldendoodles..
Goldendoodles are hybrid dogs. 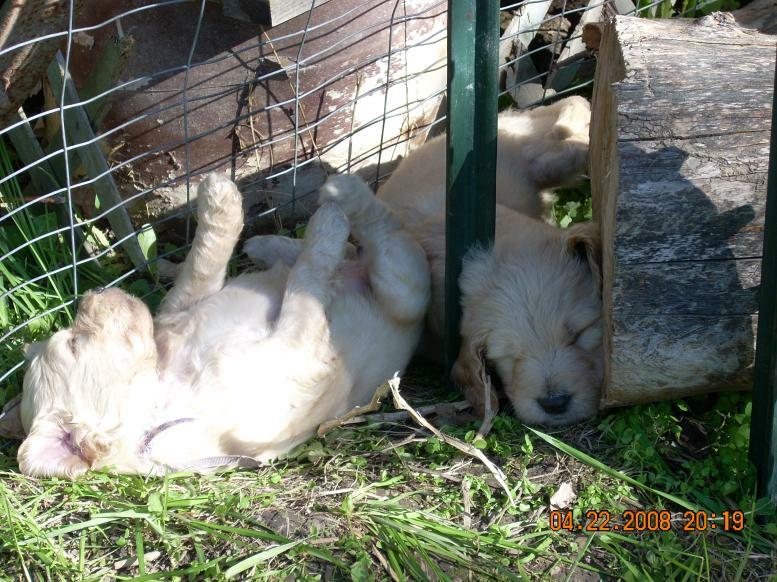 Ruth and Frank have bred their male golden retriever (named Blue) with their female poodles to create these cute and loyal dogs. Later on, they hope to have mini-Goldendoodles from their runt Dolly and their miniature poodle, Mr. Bojangles. .
We want you to cherish the same golden sights, sounds and smells of nature that we have come to love including: spectacular sunsets, eagles, hoot owls, the Milky Way, our unique dark-sky, tree frogs, a breeze rustling leaves, new-mown hay, and the fertile earth just after a gentle rain. See your shadow by the light of the Milky Way at our dark-sky site! And be sure to read our specials. Feel free to hike our 1.5 miles aiong Adventure Creek. Or go just a mile west to Casper Bluff to see the beautiful sites and hike 3 miles along the Mississippi River. Galena Log Cabin Getaway's central location near the Mississippi river and Casper Bluff make it easy for you to take a tour of Casper Bluff and the Mississippi River. See 31 burial mounds and a thunderbird effigy mound perhaps 2500 years old. Learn about several Indians who played key roles in the history of Galena. To see and print a copy of the Casper Bluff self-guided tour booklet, click the button below. Come relax with us! Ruth and Frank are the local experts in relaxing and want you to do the same. They will be glad to respond to any questions you might have about their property. If you need anything, just call Frank and he'll respond immediately. Recently, Roz Varon (reporter for over 20 years with Chicago's 7 ABC News) stayed here with her daughter and several girls in her Girl Scout troop. They participated in our very first star party. Roz enjoyed a very relaxing time. She wrote about it on her blog. Click the button below to read Roz' blog now. A year previous, Roz Varon had discovered us . We were one of only two businesses in Jo Daviess County featured by Roz . On my recommendation, Roz saw Casper Bluff. It wowed not only her camera crew but her co-anchors as well..
Click the button below to see the video now.